Duration: 2 - 5 hours, depending on the weather and your chosen route. Seasonality: The tour to the Marble Caves operates year round. January and February have the highest demand and during these months, we recommend advance reservations. Special Considerations: Be sure to follow the guide’s instructions on how to properly buckle your life-jacket, as well as his suggestion of how to sit or stand within the boat during the journey. Bring warm clothing including a jacket, fleece hat and gloves, because the wind can be quite strong at times, whipping up water from the lake. We also recommend sunglasses and sunscreen, because you’ll be on the water and the sun’s rays are amplified. Reservations: There are several operators in the Puerto Tranquilo area. Cristhopher Piñeira, Ecotravel Patagonia; (09) 56679288; contacto@ecotravelpatagonia.com; www.ecotravelpatagonia.com. Cristian Solís, Geosur Expediciones - Simón Bolívar 521; (09) 92648671; cristian@geosurexpediciones.com; www.geosurexpediciones.com; Facebook: Expediciones GeoSur. Darío Figueroa, Turismo Patagonia Mármol Tour - Pobl. A. Prat, Max Casas 795; (067) 2233286; (09) 93562138; dario.figueroa27@gmail.com; www.patagoniamarmoltour.cl. GeoTurismo Patagonia - José de Moraleda 480, Office 6; (067) 2233439; (09) 66367733 - 83565342; info@geoturismopatagonia.cl; www.geoturismopatagonia.cl. The Marble Caverns, Chapels and Cathedral of General Carrera Lake, have earned the well-deserved reputation of being one of the most visited sites in the Aysén Region. These luminescent caverns are featured on thousands of postcards, websites and books about Patagonia, making them a “don’t miss” excursion for visitors. We’re sure these amazing formations of marble and rock will steal the spotlight in your photos, too! Don’t confuse Puerto Tranquilo’s marble cathedrals with the type of marble you find in luxurious buildings or sculptures, because that type of marble has been passed through a hundred different industrial processes to polish the rock and make it shine. 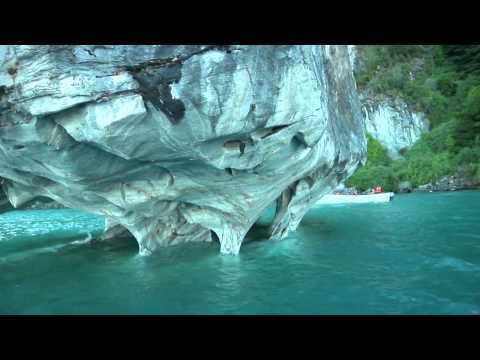 Here in Patagonia, you’ll find marble in its rawest and naturally beautiful form. According to geological research, this site represents a deposit of 5,000 million tons of marble, of 94% pure calcium carbonate, which is the main compound of this precious element. As you get close to the caverns, you’ll see that the rock contains a variety of shades. The white areas represent the purest marble in terms of concentration levels of calcium carbonate. When the white mixes with other colors, like blue, pink and green, it is due to other minerals mixed in with the marble. These rocks are more than 300 million years old, but the formation of the caves is a more recent, post-glacial phenomenon that has occurred within the last 15 thousand years as a result of powerful movements of ice and water. 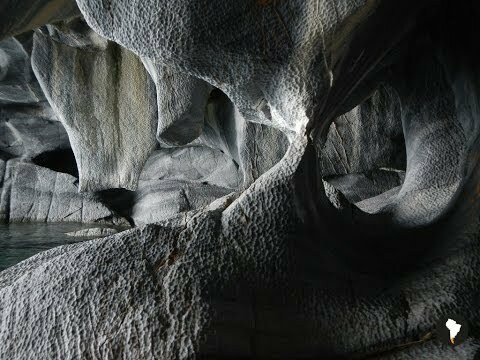 To view these unique and ancient formations for yourself, travel to Puerto Tranquilo, located between Bahía Murta and Puerto Bertrand, along the Shore of General Carrera Lake. Each summer, this quiet and tranquil town transforms into a busy hub for thousands of travelers visiting the Marble Cathedrals, General Carrera Lake, the Exploradores Valley and Glacier, the Northern Patagonia Ice Fields, and San Rafael Lagoon National Park. Puerto Tranquilo offers these visitors an ever-growing variety of accommodations, restaurants, supplies, services and shops, as well as a beautiful and expansive beach. So far, there is no ATM Cash Machine in town, so make sure you come with enough cash. It’s easy to arrange your trip to the Cathedrals; just take your pick amongst the many local operators located up and down the main street along Tranquilo’s waterfront. The tour lasts approximately an hour and a half, depending on weather conditions and your captain. However, all excursion visit the Marble Caverns, the Marble Cathedral and the Marble Chapels, each named for its unique shape and size. If you visit on a windy day, (a pretty safe bet! ), be sure to take a good jacket and a fleece hat. Choose a good operator with a safe boat and life-jackets, and then sit back for the ride. Trust the ability of your captain to navigate the waves of this giant lake as they do every day of the year. One trick is to plan your trip for early morning because usually, it is less windy. It is quite an experience to see how the guides maneuver between the marble, entering the narrow caves with extreme precision and dexterity. When the roofs are so low that you find yourself ducking, we recommend you forget about taking the perfect photo and simply enjoy. You’ll be surrounded by the marble, the clear water of the lake, and light filtering in from the outer world, creating a spectacle of color and contrasts. One of the highlights of this trip is the moment when you float in and between these immense walls of marble. Now, if you are looking for something a little less touristy, you can arrange to extend your route and include a further trip to the Panichini Islands located in the vicinity of Puerto Sánchez. It adds two hours of travel time, but we promise that it will be unforgettable, especially if it is a sunny day with calm waters. Like Puerto Tranquilo, the Panichini Islands contain several outcrops of marble, but in this sector the rocky banks of the islands are carved along their edges and the tops are covered with grassy areas that are perfect for a picnic. It’s a place so special that one person actually bought one (yes, a whole island)! Little by little, he is building a unique house inside one of the caves! 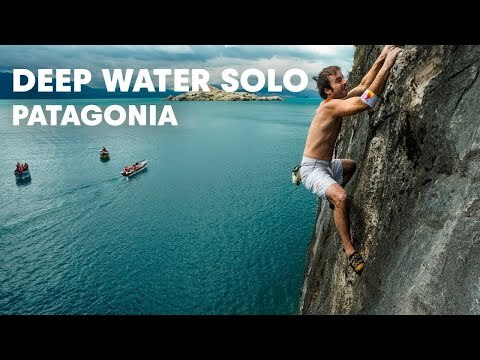 And this is only one of the thousands of stories and legends surrounding this area of Patagonia. Ask your guide to tell you what Puerto Sánchez was like when it was the economic epicenter of this sector, and to show you the ruins of the old iron boats that used to carry out the loot. It will turn a few hour tour into a full day adventure. If you are looking for an excursion with a bit more exercise and adventure, you can visit the marble caves in kayak or canoe, but you’ll need to hire a guide and rent the appropriate equipment. You can ask the operators near the lake about this option, or check out El Puesto Expeditions, where you can rent kayaks, with or without a guide. Pedro Lagos 258; (09) 51893146; expediciones@elpuesto.cl; www.elpuesto.cl; Facebook: ElPuestoHostalyExpediciones.